A Halloween-themed delay trick or treat this time? Google Play Music subscribers waiting for a native iOS app should expect no tricks, just ear-pleasing treats by the end of October. The company's All Access Music service is said to be launching a much-needed official iOS app later this month, unnamed sources have informed Engadget. 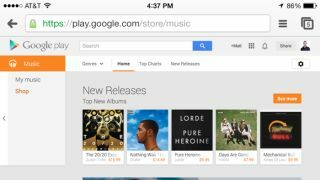 In fact, Google employees are said to be testing out a beta version of the Google Music iOS app right now. It reportedly still has a few kinks to work out before its impending release date. The native iOS app for Google's all-you-can-eat music service was previously teased to be a few weeks out by Android head Sundar Pichai at the end of May, but it has since been delayed for several months. Google first launched All Play Music in May at the Google IO conference, but the platform has been limited to computers and Android devices. This meant that iPhone 5S and iPad 4 users, for example, have been locked out of the experience entirely. They're greeted with Google's old-fashioned al la carte music store instead of the millions of streaming songs provided by All Access Music. The Google Play Music iOS app should open up the unlimited listening benefit to the subscription service and provide easier navigation of the site than the full-width store layout that's currently in place. Find out what's better: Google Music vs Spotify.